The London architecture and design studio Bowler James Brindley was responsible for remodeling the entrance hall of the luxurious penthouse on Victoria Street in London. For this, they combined the modernism of the 60s with the Rock 'n' roll style. They used a lot of rich materials such as mirrors, coloured velvet, rosewood, walnut, wallpaper and bright finishes. In fact, all the furniture, custom-made, invite you to sit, touch and "play". 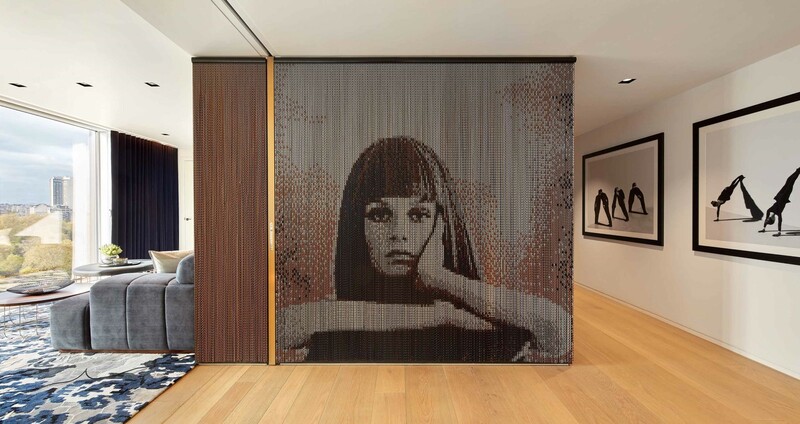 Among such a variety of details, a high definition image of the actress and singer Leslie Lawson, better known as Twiggy, is responsible for welcoming new visitors through two anodized aluminium curtains from Kriskadecor.